ObjectDock is one of the most preferred desktop enhancement utilities. As a user-friendly and resourceful alternative to the Windows task bar, it provides you a visually appealing and highly customizable dock bar that you can use for storing shortcuts to your favorite programs and files. ObjectDock is fairly customizable and you can easily change its color, font, opacity, icons, etc. to suit your personal style and preference. ObjectDock Free Download to add a skinnable dock to your existing Windows desktop. The launcher is among the most popular desktop improvement programs available in the market. The free desktop utility lets users organize their shortcuts, programs and running tasks into an engaging and interactive animated Dock. Users can have better control over their desktop icons and shortcuts with the permission to have more control over the way they manage their desktop. 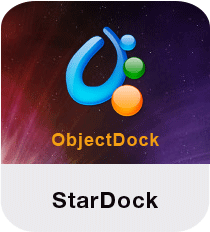 ObjectDock free software is best-known for its top-rated performance and unique style. This is what makes the launcher popular in the category of most-used desktop utilities and tools. Get ObjectDock Plus launcher to enhance and stylize your shortcut organizer with the most unique features. It is one of the perfect launchers available. ObjectDock is a useful desktop utility tool available for free for certain Windows versions. You can get the launcher now to check out its varied set of features and revive your experience with desktop launchers. If you wish to access the premium features, you can opt for ObjectDock Pro software. The launcher suffers from a few issues, especially with USB safely remove and while adding support to XP. Still it’s a nice choice of desktop utilities given its wide set of advanced features and popularity.